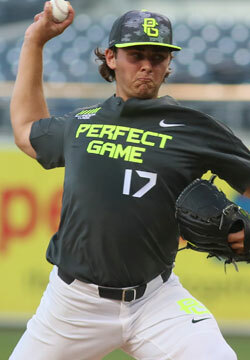 Coming out of the same high school as St. Louis Cardinals 2015 first-round selection Nick Plummer, Kauffmann was far from an unknown entity, but his performance at the Perfect Game National Showcase still turned a lot of heads. Kauffmann’s low-90s fastball is extremely difficult for opposing hitters as the pitch also offers big-time sinking action to go along with the impressive velocity. Both his curveball and changeup flashed solid potential with the former particularly standing out for its sharp biting action in the upper-70s.